Third quarter GDP was revised from +3.5% to +3.9%, but the change was mainly in net inventories, and did little to affect the assessment of underlying and longer range growth compared to the prior year of about +2.43%. Inventories have been bouncing around a bit over recent quarters and are running a little higher than they should be, indicating that some minor correction is forthcoming, especially if non-US economies are slowing down. The correction should be much milder than the one seen in Q1-2014 where GDP was negative compared to Q4-2013. 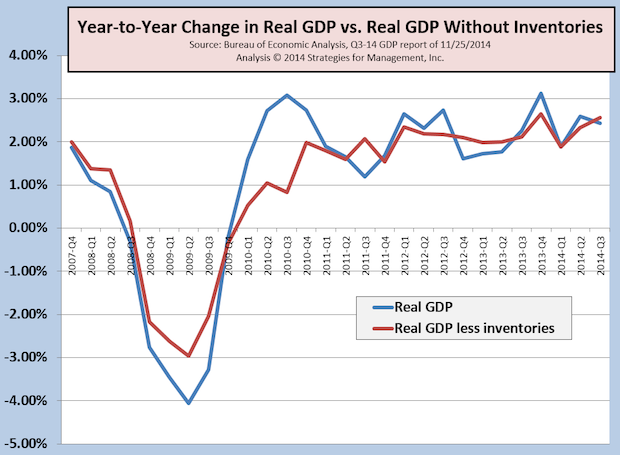 Ignoring the inventory data show that the year-to-year GDP rate is at +2.55%. The next revision will be on December 23. Q4-2014 data should be better than Q3 based on the recent ISM surveys.